Hike Distance: 1.6 miles (2.5 km) roundtrip for the short route starting from the Tioga Road; 4.6 miles (7.4 km) roundtrip for the route starting from the White Wolf Lodge. Why hike to Lukens Lake? 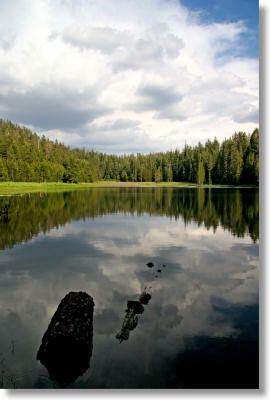 It's a small lake and lacks the mountainous backdrop that usually makes Sierra lakes so picturesque. But there's a meadow at the east end, filled with corn lilies and - if you're there at the right time and you've been good this year - vast sheets of shooting stars forming a pinkish-purple tableau so dense that it almost hurts the eyes. It's as if a squadron of Barneys had gone skydiving without their parachutes. Best time to visit: during the wildflower show. Time and quality will vary from year to year, but figure roughly mid June to mid July. Difficulty: 3 out of 10 for the short route, and a 4/10 for the long one. Both trails have only mild elevation gains. Crowd Factor: Medium. It's not uncommon to have company at the lake. Nearest Bathrooms: at the White Wolf campground, which is at the trailhead if you're taking the long route, or 1.9 miles west and 1.1 miles north if you're taking the short route. Nearest Snacks: The White Wolf Lodge, which is directly across the road from the trailhead if you're taking the long route, has a restaurant and snack shop. Which route should I take? Granted, you didn't win all those "sexiest man/woman/etc. in the hemisphere" awards by skimping on your workouts, but nonetheless, the short route has the edge here. Both trails take you through thick woods until you break out at the lake. The long trail has a few meadowettes & streams to add variety. The short route has a more dramatic entrance, though. From the long trail, you reach the lake from the west and see the meadow as just a stripe of color off the far shore. From the short trail you emerge from the dark woods directly into the meadow and (if your timing is auspicious) its circus of color, with the lake beyond. It's a stunning transition. And of course, if it's a bad year for wildflowers or you're there at the wrong time, the short route gives you much less time to grumble about what bad advice you found here while you hike back to your car. Getting There: If you're taking the short route, look for the "Lukens Lake" sign on Tioga Road that marks the trailhead. It's 30 miles (48 km) from Yosemite's east entrance at Tioga Pass, and 17 miles (27 km) from the Tioga Road's western endpoint at Highway 120. For the long route, take the White Wolf Campground turnoff from Tioga Road. It's just under 2 miles (3.2 km) west of the short-route trailhead: 32 miles (51 km) inside Yosemite's eastern entrance, and just under 15 miles (24 km) from the Tioga Road's western terminus. Travel a mile (1.6 km) down the White Wolf Campground road, and you'll find the trailhead directly across from the White Wolf Lodge. From Yosemite Valley or points south, take highway 120 north just under 10 miles (16 km) to Crane Flat, where the Tioga Road begins, then follow Tioga Road to either the White Wolf Campground road or the short-route trailhead. Parking: A dozen or so parking spots at either trailhead. Here's a Google Street View panorama of the trailhead area. Trail Notes & Hazards: Always assume that wet locations in Yosemite will have mosquitoes in the summertime. The trail through the meadow can be squishy early in the hiking season, as can sections of the trail from White Wolf. If you take the long route from White Wolf, you'll have to ford the Middle Fork of the Tuolumne. This isn't as daunting as it sounds, though - the Middle Fork of the Tuolumne River is really just a creek putting on airs, and there are log crossings. Already been to Lukens Lake? Add a Review.